Each day we are going to highlight one of the amazing research projects seeking funding in Round 4 of the #Scifund Challenge. Today we chat with Amanda Bachmann about how the people of South Dakota can become backyard scientists! I’m originally from Pennsylvania, and I moved out to Pierre, South Dakota for my job with SDSU Extension. I’ve been interested in insects ever since I learned to identify a bunch of orders and families for the Science Olympiad event ‘Don’t Bug Me.’ When I was looking at grad school options, I realized that I could make a career out of entomology. My PhD work at Penn State focused on migratory pests of vegetable crops (I spent a lot of time with soybean aphids and striped cucumber beetles). My job focus is consumer horticulture, which means I interact mainly with homeowners about their plant problems and pest questions, and I develop related educational content for our extension website (iGrow.org). Backyard Biodiversity in South Dakota is something that had been proposed by a few of my colleagues at SDSU, but they didn’t have the time to get it off the ground so they passed it on to me. While I was at Penn State, I did a few side projects that involved pollinators so I had some knowledge of the area. I think citizen science projects are a great way to involve the public in research and teach them more about how science works. I’m really proud of this project and the impact it’s having in South Dakota. Most of the 2013 participants have already told me that they’re planning on collecting data again in 2014. We have a very invested group of Master Gardeners and new volunteers who are excited about participating in 2014. If my crowdfunding is successful I will be able reach a wider audience including some of the youth and community gardens in the state. Also, in relation to pollinators, this project is something that people in South Dakota can participate in (by taking data and/or contributing to this campaign) and know that they are doing something concrete to help these beneficial insects. This is a project that can move forward with a small-ish amount of funding. Being in Extension, I also don’t have a lab in the traditional sense or a research appointment, so that eliminates quite a few traditional funding options. Also, I contribute to a lot of Kickstarter projects and I wanted to see what the experience would be like. The most difficult aspect was definitely translating my science-y writing to regular English and extrapolating enough to make it make sense to someone who’s not me. My favorite part was seeing the finished project page and how everything came together. My first research project in college involved mapping parts of the east branch of the Chagrin River in Ohio for sea lamprey larva habitat. I never encountered a baby sea lamprey, but I learned how to use surveying equipment, put my canoeing skills to good use, and only filled up my waders once. The next summer, I was in Adams County, Ohio for a month helping a PhD student with her field work and getting eaten alive by chiggers. After all of that, doing field work in an agricultural setting was comparatively very cushy. 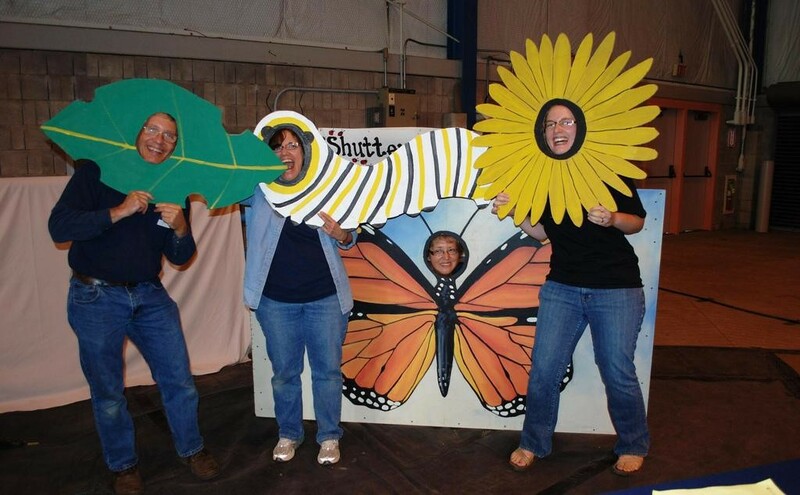 The picture is from the 2011 Great Insect Fair. I’m with some of the Centre County Master Gardeners, and their work with the Snetsinger Butterfly Garden at Tom Tudek Memorial Park (http://www.snetsingerbutterflygarden.org/) was definitely an inspiration for what I’m doing in South Dakota. You can find Amanda’s project here.